Joe Montford was born July 30, 1970 in Buford, North Carolina. He played collegiate football at South Carolina State University and in his last season he led the team in tackles with 131. Montfort’s CFL career began in 1995 when played one season with the US Expansion team the Shreveport Pirates. He was acquired by the Hamilton Tiger-Cats after the US dispersal draft in 1996. Montford had a stand out season with the Tiger-Cats in 1998. He led the CFL with 21 quarterback sacks and six forced fumbles. He was chosen as linemen of the week on three different occasions during the regular season and for the first time in his career he was named a CFL All-Star and the Most Outstanding Defensive Player. 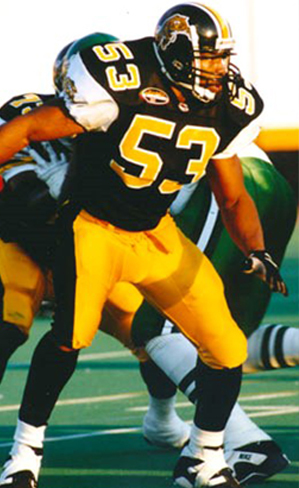 Montford was a key player in the Tiger-Cats defense helped secure a Grey Cup victory in 1999. He led the league in quarterback sacks with 26, and picked up five fumble returns for 99 yards and three touchdowns. This season would also mark his second Eastern All-Star and CFL All-Star honours. In 2000, Montford led the league in quarterback sacks for the third straight year, as well as setting a new record with three consecutive seasons with a minimum of 20 sacks. He was also the league leader in forced fumbles that season with eight. He yet again won Eastern and CFL All-Star honours, as well as being the Tiger-Cats nominee for the Most Outstanding Player Award. After a brief stint with Toronto Argonauts, Joe Montford finished his career with the Edmonton Eskimos where he won his second Grey Cup ring in 2005. Montford was voted number 40 on TSN’s Top 50 CFL Players.